Bafana Bafana head coach Stuart Baxter says he’ll pack his bags if it’s felt to be in the best interests of the national team. South Africa take on Libya away from home on March 22 in their final match of the 2019 Africa Cup of Nations (Afcon) qualifiers. With civil unrest in Libya, the match venue is yet to be confirmed but is expected to take place in another north African country. A draw will be enough to take Bafana through to the finals in Egypt in June this year. For Baxter, an ideal situation would be not only to secure victory over Libya, but to do so with a performance that bodes well for the future of the team under his guidance. Lose, and he would be ready to quit his post, he has admitted. Even Afcon qualification would not necessarily be a reason for the Brit to remain at the helm. One thing Baxter did make clear is that he won’t be holding the South African Football Association (Safa) to ransom over any kind of contract pay-out. “If we don’t qualify, certainly I will tell Safa, ‘you better make sure that you really want me to carry on, because I’ll walk if you want’,” the 65-year-old said. “All this nonsense about, ‘it’ll cost SAFA a fortune’ to get rid of me – you can ask the guys sitting with me [Baxter’s SAFA colleagues, during a media briefing], it will not cost them a bloody fortune. 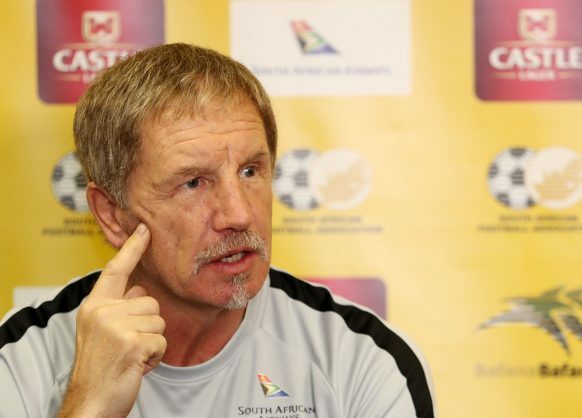 Baxter began what is his second spell as Bafana head coach in May 2017, and in his first match in charge, he guided South Africa to a 2-0 win away to Nigeria in an Afcon qualifier. Results overall have been mixed – back-to-back defeats against both Cape Verde and Senegal ended Bafana’s hopes of qualifying for the 2018 World Cup. For the most part though Baxter seems to have done just about enough to retain the faith of hard-to-please South African soccer supporters and the often critical media, although his team selection has been called into question. South Africa’s most recent action came back in November last year, a 1-1 draw with Paraguay in the Nelson Mandela Challenge Cup, three days after they hosted Nigeria in an Afcon 2019 qualifier, which ended in the same scoreline. With no action for the national team since then, there is concern as to whether Bafana are adequately prepared for the crunch encounter with a tricky Libya side.